Our good friends at PetPlan have created a guide with some tips to keep our pups and kitties safe and healthy when the weather turns cold. Animal hospitals throughout the Philadelphia area see some specific cold-weather injuries and illnesses when the temperature drops. What are the most common cold-weather issues we see at Newtown Square Veterinary Hospital? Sore paws from salt and other de-icers. Far and away, this is the most common “winter ailment” we see. It seems especially to affect our canine friends with furry feet (think Golden retrievers and doodles!) Before taking Fido out in icy weather, leave a towel or washcloth soaked in warm water by the door. When you return home, use it to wipe Fido’s feet. This can also help melt any snow or ice clumps which may be adhered to those furry feet. Soft tissue injuries from slipping on ice and icy snow. These injuries are common, but can be avoided. When the sidewalk is slick, keep Fido on a tight leash to prevent him from running amok. Walking on grassy surfaces covered in snow can safer, since it provides more traction. Avoid off-leash running and fetch when the ground is slick, especially when snow is hard and icy. If your dog does seem to come up lame after being outside in the ice and snow, check his paws to ensure there is no snow or salt caked on the foot. If the lameness persists, call NSVH for an appointment so we can do a thorough examination and rule out a more significant injury. Cracked paw pads, cracked noses and dry skin. Cold temperatures, bare paws on salty/slippery surfaces and dry heat indoors can all contribute to dry skin. If your dog spends a lot of time outdoors in the winter, consider booties such as those made by Ruffwear. Some dogs will tolerate application of emollients like Aquaphor to the nose and paw pads, but other dogs will just lick away any ointment that’s applied. If your pup has dry, flaky skin (and other underlying dermatologic diseases have been ruled out), we may prescribe a high quality fish oil supplement. NSVH’s fish oil supplement of choice is Welactin, made by Nutramax labs. Housebreaking regressions (or transgressions?) 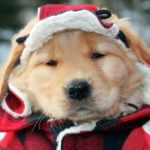 Many dogs, particularly toy breeds, do not enjoy the cold weather or the snow. Cold, wet weather can discourage some dogs from eliminating outside. 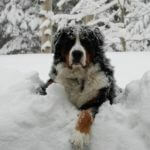 What can you do to encourage Fido to eliminate outdoors in inclement weather? If there is snow accumulation on the ground, shovel a large area down to the grass so Fido has somewhere familiar to eliminate. 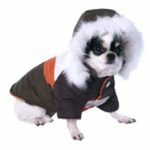 If Fido shivers or seems obviously cold, consider purchasing him a jacket or sweater. If it is snowing or actively raining, use an umbrella to shield Fido from the elements and keep him dry. Bring high value treats with you to encourage and reward your pup for eliminating outside; if Fido doesn’t go when you take him out, consider crating or confining him until you can take him out again. This may discourage him from eliminating on your carpet! Sometimes Pups Need to Muzzle Up!